"I have nothing to tell of Eleusis, following so many descriptions by others, except that I walked amidst the ruins, I went down to the harbor, and I stopped to contemplate the Strait of Salamis. The glory and the pomp had passed; the same silence possessed both land and sea: no more cheers, no more chanting, no more ceremonies on the shore, no more warlike cries, no more clashing of galleys, no more tumult on the waves. ​My imagination was scarcely adequate, now to conjure up the religious procession to Eleusis, now to clothe the shore with that innumerable army of Persians, spectators of the naval conflict at Salamis. Eleusis is, in my view, the most venerable site in Greece, because there the unity of God was taught, and because that place witnessed the greatest effort men have ever made on behalf of liberty." The archaeological site at Eleusis. Eleusis or Elefsina, a town with a population of 30,000 inhabitants, is situated 20 km away from the city of Athens and is easily approachable by car. The town is known for both its ancient and its modern history. In ancient times it was considered to be, for almost 2000 years (1600-400 AD), one of the five sacred cities, where the Eleusinian Mysteries attracted for years pilgrims from all over the known world. Thanks to the great tragic poet Aeschylus, Eleusis gets even more famous in the ancient world as well as in our days. The famous Sanctuary of Demeter and Core (her daughter Persephone), one of the most important religious centers of the ancient world, where the Great Mysteries were celebrated every year between September and October and lasted nine days took place here. Excavations eventually brought to light the entire Sanctuary. 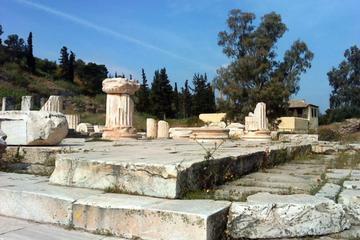 Eleusis was founded in the 2nd millennium BC; the sanctuary became pan-Hellenic in the 8th century BC. Today, the city has mainly industrial character with obvious, however, indications of its older attributes, such as the aristocratic houses of the early 20th century, as well as the neighborhoods with one-floor houses and the old industrial buildings. The district around the harbor, where ruins of the ancient breakwater are preserved, is also of interest. ​The small museum houses sculpture and other very remarkable antiquities. The citizens of Eleusis worshiped Demeter, the goddess of nature, spring and agriculture. The myth of Demeter and her daughter Persephone is, like most myths, allegorical. It refers to the rebirth of plant life, following its “death” in winter, and the eternal longing for immortality. According to a hymn of the 7th century B.C., one day the earth opened up in two, Plouton, the god of the underworld appeared, and seized the young Persephone. He took her to his kingdom and made her his wife. Her mother looked for her in despair. She looked for her nine days and nights, without success. She arrived despairing at the doorstep of the palace of Keleos, king of Eleusis. She became the nurse for his son, not revealing that she is a goddess. When her real identity was revealed, she requested that a temple be built in her honor. She remained in the temple, devastated by the loss of her daughter. The following year, not a seed grew on the world. Zeus was worried. He sent Hermes to appeal to Plouton. A compromise was reached: Persephone would remain in the kingdom of Plouton for one third of the year, and the remaining time she could stay with her mother. Overjoyed, Demeter allowed the plants and flowers to grow, and the earth became fruitful again. The Eleusinian mysteries were named mysteries because the most important part of the event, involved intense mysticism. We don’t know much about the worship of Demeter by thousands of people for over 15 centuries. The Great Eleusinian Mysteries had their starting point in Eleusina. The remarkable procession moved on to Athens through the Sacred Way and headed by the priestess and the sacred symbols of the worship of Demeter. The Mysteries were concluded with ceremonies in honor of the dead. After the ceremony, Athenians would return to Athens. The Eleusinian mysteries were abolished in the 4th century BC by the Byzantine emperor Theodosios. Displayed at the Museum of Eleusis are the finds of the digs of the sanctuary and the western cemetery. Worth seeing is the Early-Attic Amphora of Eleusina (650 BC). The neck of the amphora is decorated by a depiction of the blinding of the Cyclop Polyphemos by Ulysses. On the main body of the amphora, Perseus beheads Medousa. Also worth seeing is the Kori from the pediment of the Ieri Oikia (Sacred House) (490-480 BC). It is the statue of a running maiden, her head turned to the left. Located near the archaeological site, it was the most significant necropolis of the ancient city. A conglomeration of prehistoric graves, presumably belonging to the personage of the tragedy Hepta epi Thébas (Seven against Thebes). Emperor Hadrian had a special regard for the Eleusinian Mysteries in which he himself was initiated on his first visit in 124 AD. In order to facilitate the course of the Sacred Procession to the Sanctuary he built a monumental bridge over the Eleusinian Kephisos River, which often flooded. The bridge was 50 m in length, 5.30 m in width and was supported by 4 arches. It is one of the few bridges still preserved from antiquity. In the courtyard of the sanctuary of Eleusis two monumental gates were erected by the Panhellenes: one at the end of the road coming from the Peloponnese and the other at the end of the road coming from the port of Eleusis. Both were exact replicas of the gate of Hadrian in Athens. The inscriptions, engraved in large letters on both sides, informed visitors that the gates were erected in honor of the two goddesses of Eleusis and the Emperor, referring to Emperor Hadrian. In the 1860s Eleusis began to change its urban profile with the construction of new buildings and the installation of certain small crafting industries. During the 1880s, the industrial development was started with the foundation of a soap factory (CHARILAOU -1875), the cement factory of TITAN (1902), and distilleries BOTRYS (1906) and Kronos (1922). In 1922, 2000 refugees from Asia Minor were settled in Eleusis, doubling its population. After WWII hundreds of employees from all around Greece, moved to Elefsina in order to work in the industries of the area. 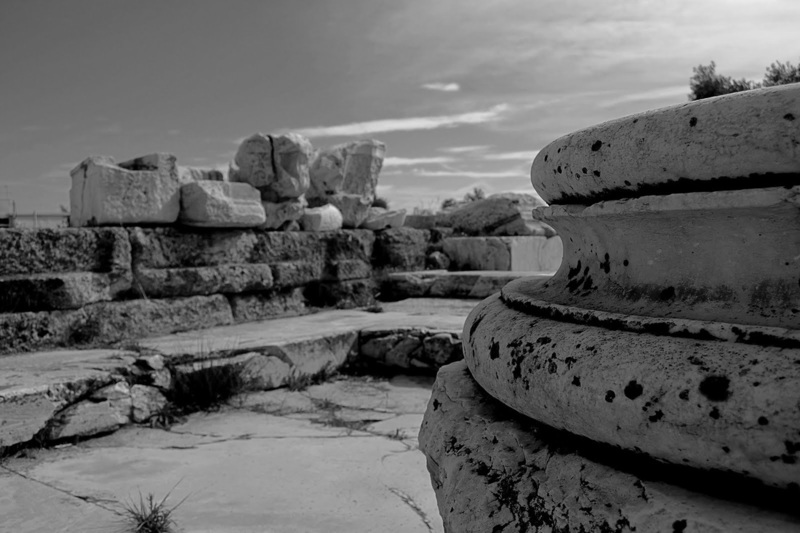 During the 21st century Eleusis is developed into a modern town which disposes of the distinctions of a glorious past. It constitutes the administrative center of the wider area and is the headquarters of the Prefecture of Western Attica. The Archaeological Site and its Museum constitute areas of international promotion and tourist attraction. ​Furthermore, the Festival “Aeschylia”, the cultural events organized by the Municipality each autumn, is nowadays an institution that gives the possibility of expression of modern cultural matters of the town. Therefore, alongside with the economic development, the ongoing efforts for infrastructural improvement and protective environmental measures, efforts are made from the side of public authorities, private associations and individuals, for rehabilitation of the spiritual character of the town, so as to be worthy of the heritage that bears the name “Eleusis”. Travel by climate-controlled minivan with a private English-speaking guide to the birthplace of the dramatist Aeschylos and home of the Eleusinian Mysteries and explore ancient ruins of temples, arches, and fountains. The selection panel of independent experts responsible for assessing the Greek cities competing to be European Capital of Culture in 2021 has recommended that Elefsina should be awarded the title. The formal designation of Elefsina by the relevant Greek authorities is expected to take place in the coming months. Started in 1985 on the initiative of the then Greek Minister of Culture Melina Mercouri, European Capitals of Culture have developed into one of the most ambitious cultural projects in Europe to become one of the most appreciated activities of the EU. The original motivation of the project is more relevant than ever. It is to provide Europeans with an opportunity to learn more about each other's cultures, to enter into intercultural dialogue and to enjoy their shared history and values: in other words, to experience the feeling of belonging to the same European community. Along the years, the European Capitals of Culture have grown in scope and size, contributing to the cultural, social and economic development of many cities and their neighbouring regions across Europe. To read more about Eleusis 2021, follow this link.